by up to $8,475. Every Year. When I first created this program I had no idea that it would be able to help some Funeral Homes increase their annual revenue by thousands of dollars every year. In fact, I was simply just trying to help people during a challenging time in their life just like you do everyday. Now, every funeral director that I talk to is interested in having me teach them the specifics of my program to teach them how to increase sales and service in their funeral homes also. Why? Because they instantly see how valuable it is. As a result they are increasing their yearly revenue. Every Year. The best part to me is not only are they increasing sales...but they are also providing an extra service to their clients... a tool that is helping them through these tough times... and it is all accomplished simply by providing their clients with 1 extra piece of paper. I'd like to help you also increase sales at your funeral home and also help you improve your service to your clients. I am going to tell you everything in this letter. You're going to learn the best ways to increase your sales. The fees you can expect to charge once you’re up and running and more. This all started in November of 2006. My name is Christopher Hallenbeck. In 2006 my Grandfather passed away suddenly. He was 90 years old. But it was unexpected. I'm the oldest grandson and also my family knew that I had a talent for writing. So my mother asked me if I would write and read the Eulogy at his funeral. Since then I have had to write and read many more eulogies for friends and family members. In addition I've also since then have had to write obituaries along with eulogies for some of my family. A few years later I began to publish some of my writing. I became an author, and I also started my own publishing company. Recently I finished writing a project for the funeral industry, and I knew instantly that I'd just created something BIG. Something that other businesses would find just as valuable, and I knew that it could help funeral directors and funeral home owners. So I called a guy named Brian Barnett. 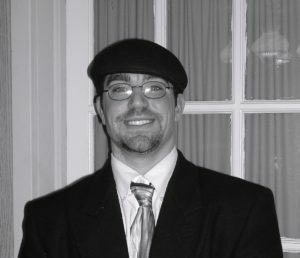 Brian owns Ehle and Barnett Funeral Home, located in Johnstown, NY. I asked him if we could meet so I could show him my new project. During the meeting Brian saw the value in this project and he became my first client. The Funeral Director's Treasure Map. In short, it is a step by step guide to help you increase your sales and improve services to clients simply by providing them with one extra piece of paper. According to The National Funeral Director’s Association the average NFDA-member funeral home handles 113 calls per year. Next, keeping it simple, let’s say that each Funeral Home charges $1,000 for their services per each call as their basic arrangement charge. This would bring in a yearly revenue of $113,000 based on 113 calls. Would you be interested in learning how to accomplish this? I'm going to teach you exactly how you can accomplish this right now. Earlier you read that I am an author. These books are step by step tutorials. They teach how to write obituaries and eulogies that display the personality, and uniqueness of a family member or friend’s life. The books also include 7 obituary examples and 7 eulogy examples. With the samples provided the reader learns the structure of an obituary or eulogy quicker, and also has ideas provided of what to write about. When combining the step by step tutorial along with brainstorm ideas that he or shes learns by reading the examples, the reader is now able write the obituary and eulogy faster and easier-Knowing that their compositions will impress the audience and it will also serve as a great honor and beautiful tribute to the deceased. Now, the 1 piece of paper that I just mentioned that can help expand your services and increase your sales is essentially a one page tutorial that you would provide to your clients. How does the 1 Page Tutorial help increase sales? When a customer is looking at my online book store and sees these two books. This is what they see on their screen. Now let’s connect the dots and add all of this up on how this can increase money in your pocket. The one page sheet is a simple 5 step tutorial that teaches your clients how they can download the two books. It supplies the client with directions and a coupon code to download copies of the books as a free checkout at The Great Point Publishing Bookstore. When your funeral home increases services by now supplying your clients with the 5 step tutorial that teaches them how they can download The Obituary Writing Workbook and The Eulogy Writing Workbook. Instead of basic arrangement charge of $1,000, now by supplying the 1 page tutorial you are increasing your services. This enables you to increase the basic arrangement charge. Let’s say that you increase the charge $75 so your new basic arrangement charge is $1,075. When you provide the instructions for the client to download the books. You can include this additional service as part of your normal basic arrangement charge. $50 for the books. Plus $25 service charge = $75 increase in your basic arrangement charge. This is how we presented an increase of $1,000 to $1,075. Now again let's take it a step further. Based on The National Funeral Director’s Association average of each funeral home handling 113 calls per year, this would increase their yearly revenue by up to an additional $8,475! This is how you can potentially increase a yearly revenue from $113,000 to $121,475. Your additional revenue estimate is based on the number of calls that your establishment handles on a yearly basis and helps you predict how much you could increase your sales revenue simply through increasing the service of selling one piece of paper which is the 5 step tutorial. Here's how it all works step by step in The Funeral Director's Treasure Map. Step 1. Client visits your funeral home to plan for funeral arrangements. Step 2. 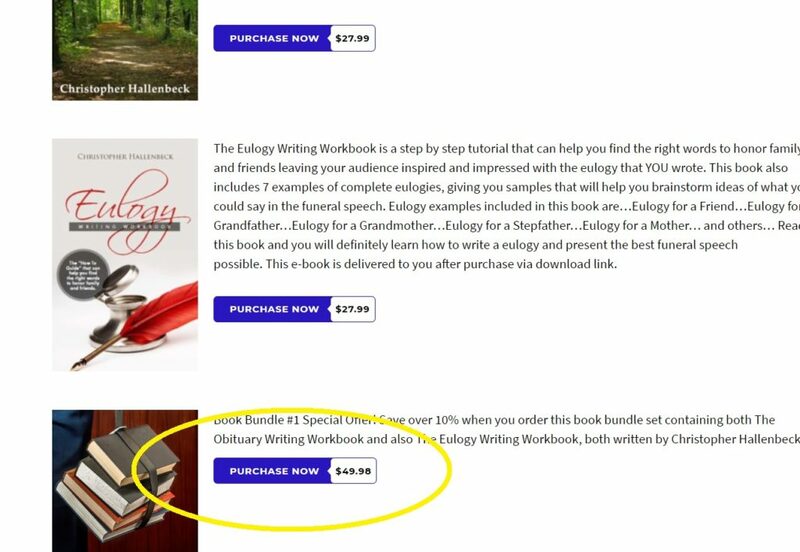 Prior to this visit you would print out a copy of the 5 step tutorial on how to download copies of The Eulogy Writing Workbook and The Obituary Writing Workbook and place them in a folder. Step 3. The client follows the directions presented on the one page tutorial. The tutorial directs them to the webpage that teaches them how to apply their coupon code and download copies of the books. Step 4. The client then enters the necessary information including the coupon code which is provided to them on the one page tutorial. Step 5. The client will receive the download links in their email where they can download and read copies of the books electronically. Bonus Tip: You might want to consider giving the family two copies of the one page tutorial just in case one person is writing the obituary and a separate person is writing the eulogy. Bonus Tip #2: Through providing directions on how a family can write an obituary on their own. This could be less work for you as you'll no longer have to compose the obituary yourself. Note 1. All books are pdf stamped with the name and email address of the person who downloads them. The books are also encrypted meaning that you can print out the books however you will not be able to copy anything from them. Note 2. If clients have further questions they are instructed to not contact the funeral home. Instead they’re directed to a help email provided. 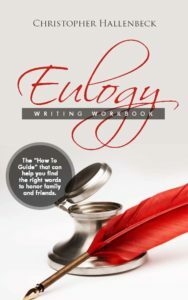 The Obituary Writing Workbook and The Eulogy Writing Workbook are only available at our online bookstore. This means that the only place customers can purchase them is at our website or by using a coupon code which are distributed only through our partnerships with funeral homes. You acquire the 1 page tutorial by partnering with my company Great Point Publishing LLC in offering this service together as a collaboration. These partnerships are meant to help you provide a more personal service to your clients. …There is really not much to change to the system that you already have in place. You simply just need to print out a sheet of paper. Then place it in a folder. The Funeral Director’s Treasure Map. 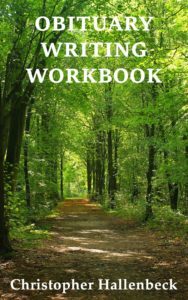 The full copy includes your customized 1 page tutorials containing instructions & the coupon codes. Next simply go to the appendix, chose which tutorial you want to use. And print that page. For your convenience There are two options here. Is a tutorial page formatted so you can print this on your company letterhead. Is a tutorial page that you can print out faster & easier on computer paper. This was provided in case you prefer to save your letterhead paper. Note - Options 1 and 2 both contain the same exact coupon code in the tutorial instructions. Print out 50 tutorial pages at once so you’ll have them on hand even before your daily meeting preparation. Where do you sign up and how much does this cost? The cost for the Partnership Program is normally $4,999. for the rest of your career. Having said that, I don’t think $4,999 is the right price. After all, I’d like you to be able to get started as soon as possible. Think about it this way: With this service, if you handle just 3 funeral calls each month. When you utilize The Funeral Director's Treasure Map and present the 1 page tutorial to each of those clients. Three calls a month works out to an additional revenue of $225 for you. That's more than the cost of The Funeral Director's Treasure Map monthly payment in just one month! Plus if you handle more than three calls in a month that's all extra revenue for you! In other words, in just one year the service could easily pay for itself. However, today I’ve arranged to make this deal even better. $2,500 is an amazing price considering that this is a lifetime partnership. But if you reply to this offer now, I’ll give you an extra discount- that totals 97% off when you pay a special introductory price- a one time payment of only $149 for The Funeral Director's Treasure Map. You only have to make a 1 time payment to be able to increase sales every year. It’s important that you realize this price may never be available so cheaply again. Personally, I think you’ll be making so much money from this that the special introductory price will seem like peanuts once you get going. 1. ...an email immediately containing the download link to obtain your copy of The Funeral Director's Treasure Map. This is important. I'll explain why in just a moment. 3. Our 60 Day Money Back Guarantee. 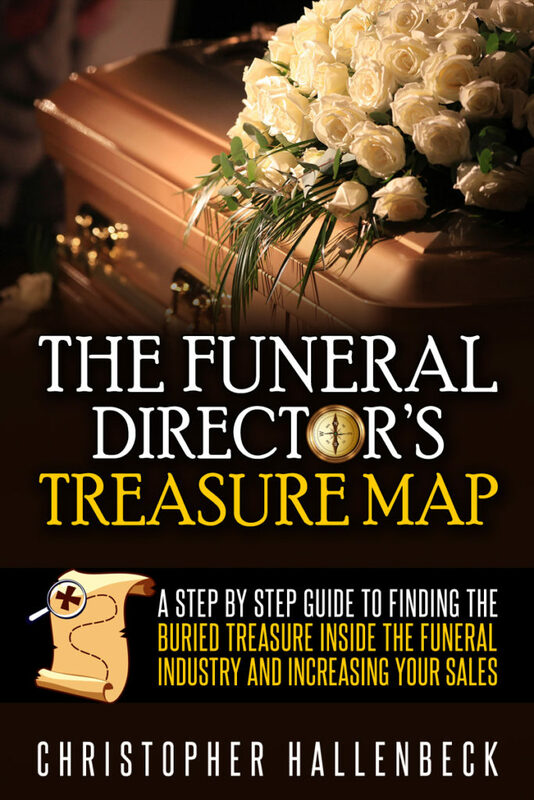 I'm so confident that The Funeral Director's Treasure Map will help your funeral home increase sales and improve service at your establishment that I'm willing to give you a 60 day money back guarantee with your purchase. When it comes to your success, I want to see you have the best sales that you're able to. The Funeral Director's Treasure Map will not be available at this cost forever. This is special introductory price to help you increase your yearly revenue. And also help improve services to your clients. Every Year. There's no need to renew. This might even make less work for you. Clients might want to write obituaries on their own now so that you won't have too anymore. Get access to your program for the special introductory price of only $149 and get started today. Once you go through the material you’ll see immediately how valuable this project is to your business and to your clients. But if you want begin utilizing this in your sales strategy to increase revenue, you have to hurry. There’s no guarantee how long the price will stay this low. The next time you see this offer, it could be at a much higher price. CLICKBANK® is a registered trademark of Click Sales, Inc., a Delaware corporation located at 1444 S. Entertainment Ave., Suite 410 Boise, ID 83709, USA and used by permission. ClickBank's role as retailer does not constitute an endorsement, approval or review of these products or any claim, statement or opinion used in promotion of these products.